From the 2011 Breakfast with Santa at the Randall Fire Station in Bassett. Santa Claus is coming to Randall. Santa will be taking time out of his busy schedule to visit the kids of Randall, Saturday, Dec. 8 . At 10 am Santa will begin visiting all the town neighborhoods trading his sleigh for a Randall Fire Department truck. Santa will be stopping along the way, so all good boys and girls can visit him and get a candy cane too. On Sunday, Dec. 9 starting at 8 a.m. Santa will be at the Randall Fire Station No. 2 located at Highways F and KD for a pancake breakfast. 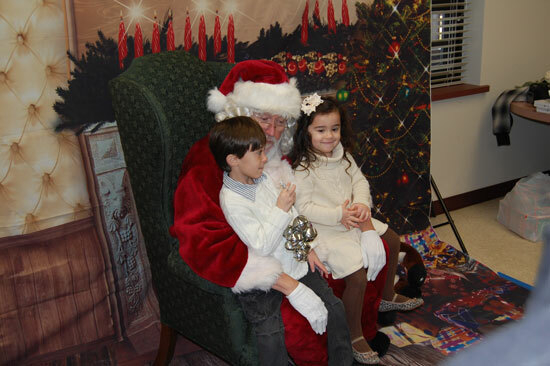 Santa will be taking Christmas requests and having pictures taken until 1 p.m. Don’t forget to bring your camera. Breakfast is free to all. The Randall Fire Department will also be conducting a food drive at this time. Please help the less fortunate during the holidays by bringing a non-perishable food contributions to the station. Posted in: Events, Police/fire, Randall.